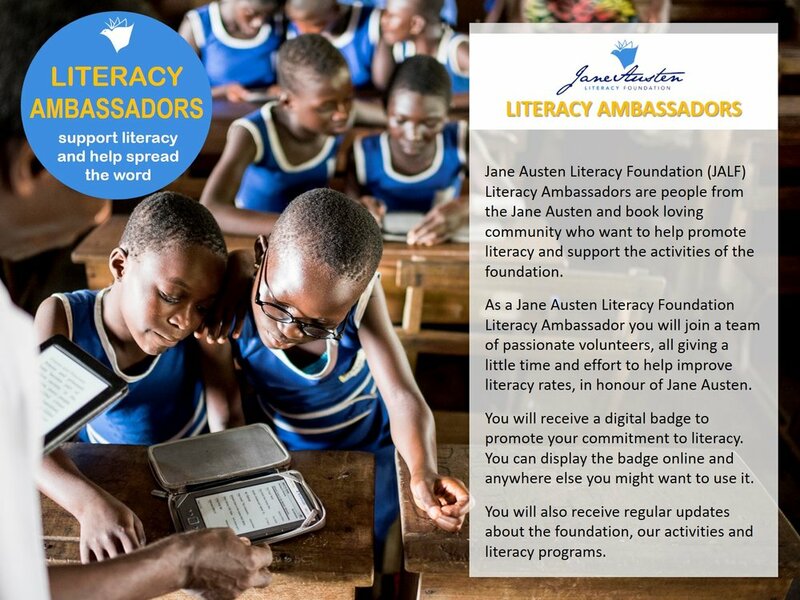 The Jane Austen Literacy Foundation is looking for volunteer Literacy Ambassadors to help us improve literacy rates in developing communities. As a Jane Austen Literacy Foundation Literacy Ambassador, you will join a team of passionate volunteers, all giving a little time and effort to help improve literacy rates. You will receive a digital badge to promote your commitment to literacy. You can display the badge online and anywhere else you might want to use it. You will also receive regular updates about the Foundation, our activities and literacy programs. Literacy Ambassadors help increase awareness of the Foundation and what we do by periodically sharing key messages and campaigns online and/or in physical locations, such as your book club, local library or Jane Austen group. Literacy Ambassadors are also asked to raise £100 a year for the Jane Austen Literacy Foundation Literacy Libraries Program. 100% of the money raised will be spent on providing Literacy Libraries for children in developing communities. If you would like to be a Jane Austen Literacy Foundation (JALF) Literacy Ambassador, email admin@janeaustenlf.org for an information and sign up pack. We would love to have you join our wonderful team of volunteers helping to increase literacy rates, in honour of Jane Austen.